Thanks for your interesting informations over your Hounds. are great team. They play and run every day of our ground. 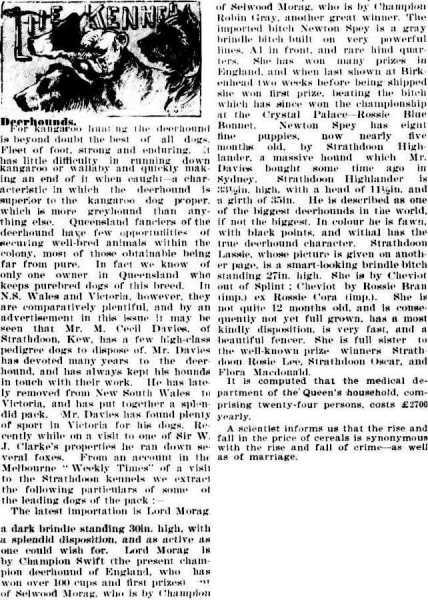 I have found in the internet an old article (year 1952)in the Newspaper "Camperdown Chronicle"/Australia. 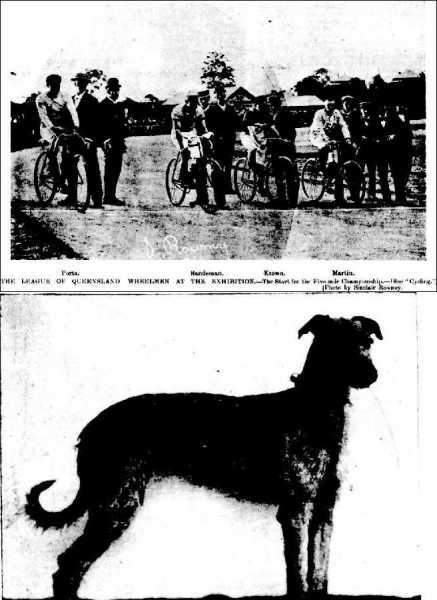 Mr. Mummery had the Deerhound Reiver of Geltsdale imported from UK. What is the difference between Deerhound and Staghound? I think a Staghound is result of unknown breeding between Scottish Deerhound, Greyhound and several other breeds or? Thanks for interesting informations and your link to the web site. Reiver of Geltsdale is from the litter from "Morven of Rotherwood x Irenic of Ross". Here is a link to the pedigree from Reiver of Geltsdale. 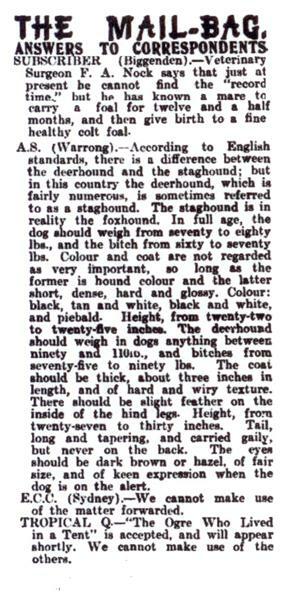 In the August (2010) issue from "Deerhound" (The Official Journal of the Deerhound Club of Victoria Inc.,Australia) was print the interesting article over Dr. Donald Thomson from THE NORTH QUEENSLAND REGISTER,SATURDAY, MARCH 30, 1935. Dr.Donald Thomson takes with by the expeditions to the Aboriginals, the most complete anthropological equipment and 3 hounds ( 2 large Deerhounds and 1 Greyhound). Here is a link to informations over Dr.Donald Thomson (1901 - 1970: Anthropologist, Zoologist and Photographer)and book over him. What a fantastic thread! Would love copies of the photo's - wonderful! I have found this article with picture. Last Edit: 5 years 10 months ago by Joerg Yoki. Here is a link to an Internet-site with the Wolfhound theory. Last Edit: 5 years 8 months ago by Joerg Yoki. One of the great heroes of Irish history, Cú Chulainn translates as Culann's hound. Also Cameron of Lochiel, mentioned in the article killing the last wolf, is a legendary hero in Scottish history. 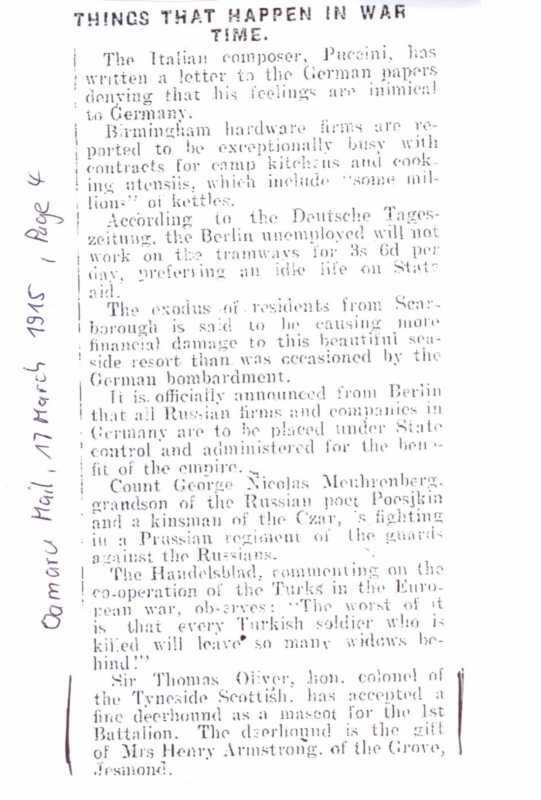 Here is link to an another historic article. I found this article over pictish animals. by C. A. GORDON, F.S.A.SCOT. a division of the dog family which includes the hound. It is, in fact, a deer-hound. head of the composite animal at Manbean4 may stand as the type (PL XXIX, i). from a burial site near Kiev.6 ................"
What an interesting Topic ... I have found a very interesting page about Deerhound Breeders of the 20th Century, there are so many nice photos - I love the pictures with Miss Noble and her hounds at the coursing field so much. I wish I could have been there to seen it. So here is the link, hopefully. Last Edit: 5 years 3 months ago by Wanda. Thank you Sabine for the link to the web site with the many historical photos. I'll take the link in our directory. 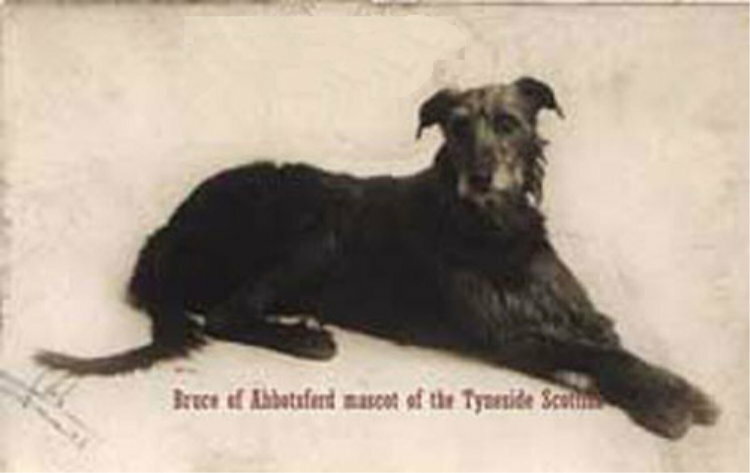 Bruce of Abbotsford was the mascot of the 1st Battalion, Tyneside Scottish (ca.1915). Bruce was a gift of Mrs.Henry Armstrong to Sir Thomas Oliver (hon. 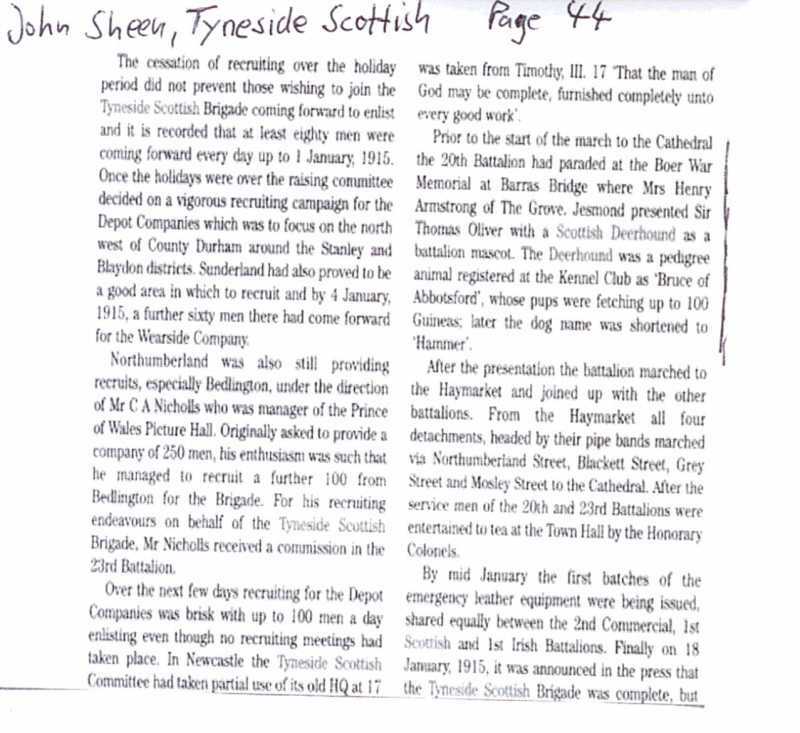 colonel of the Tyneside Scottish). Last Edit: 2 years 10 months ago by Joerg Yoki.